Recently I was snooping around in Blogland and I came across an AMAZING site. It's called deviantArt and it appears to be an online gallery for artist to showcase their work. I saw some outstanding talent and tons of images just perfect for cards. The images are also FREE! One gallery really appealed to me, so these 4 characters are all designed by the same artist. Her name is Sureya and you can see all of her work HERE. The cards are one layer. I cut around the heads for a little extra dimension. These girls are too cool :) Originally I planned to have only the image and sentiment. Not sure where the dot idea came from but I was nervous about it, figured I was likely gonna ruin the cards by doing it, but I like how it turned out. I glossy accented all the eyes, and some parts of the images. Like the gun and knife here. Card and Scrap - BLING. Smudgy Antics - ANYTHING GOES. Okay, I totally love how you colored these people! So COOL!! The fussy cutting around their heads is such a fab idea! I know Sureya's art, in fact I coloured an image of hers last week. (What a coincidence, eh?) Love what you've done, I think the dots are fantastic! Lovely selection of cards. Thanks for joining us at Stampalot this month. Those images are so, so fun! Thanks so much for playing with us at CAS-ual Fridays! I think those dots give your card a bit of movement. Love that bit of sparkle. 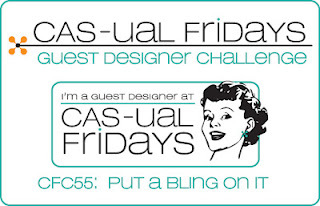 So glad you could play along this week at CAS-ual Fridays! your pieces are wonderful.So perfect.I love them.